CD of obscure band | That Belongs in a Museum! It’s an obscure CD from a band that may or may not exist anymore. I went to see this band during my year off between high school and college. A friend of mine was roadying for them and they were going through Gainesville, FL, said, “Hey, we’re at Eddie C’s, come out and see this band!” […] The band is called SNMNMNM. They signed their CD for me, all to my high school nickname of Skittles, because I dyed my hair a lot. 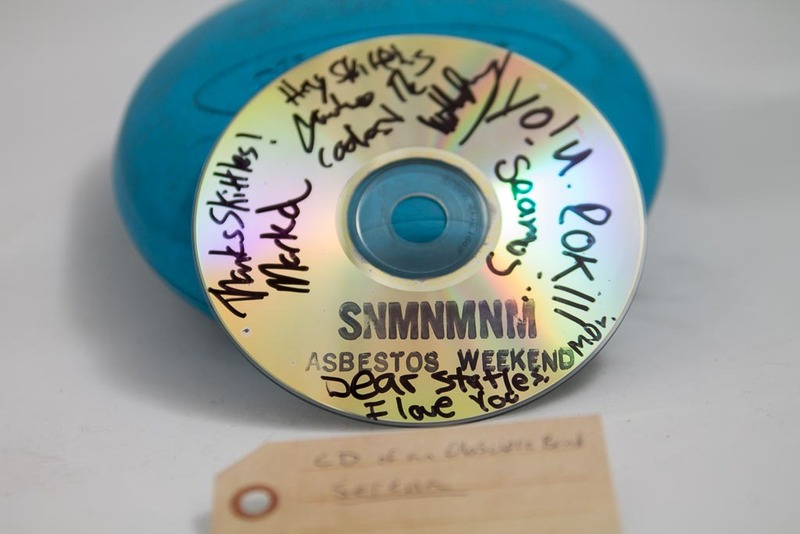 […] I listen to this all the time, and it’s only like 6 songs, and it’s their first non-self-released album called Asbestos Weekend. They’re very charming, they have a tuba on every song. […] I went back and checked their website and this album no longer existed. All the songs on it were divided into two other subsequent albums. Now it’s listed on their Wikipedia page, so maybe it is a real album.